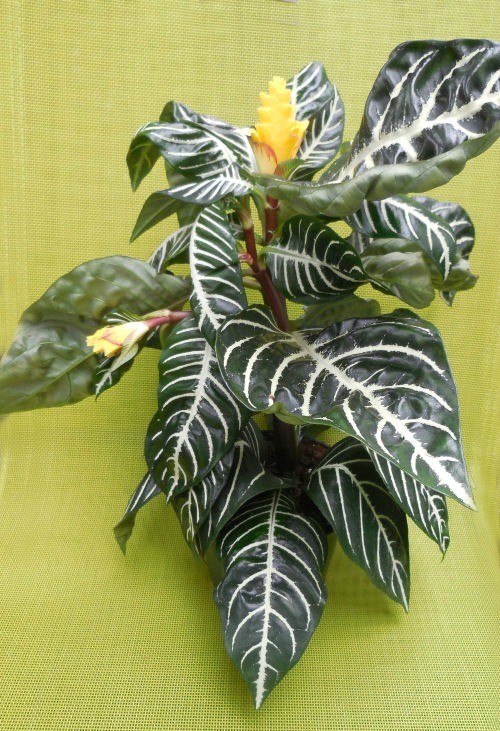 Aphelandra squarrosa, also known as zebra plant can be a real challenge to grow. But the spectacular flowers and showy striped leaves make it worth the effort. When I lived in Australia, a zebra plant was always one of the popular indoor plants that I wanted to grow. I got one and managed to keep it healthy but never could get it to flower. I’ve since mastered the art of getting it to bloom, but it takes just the right conditions for the pay off! Give it a try because there is nothing quite like the look of exotic houseplants. 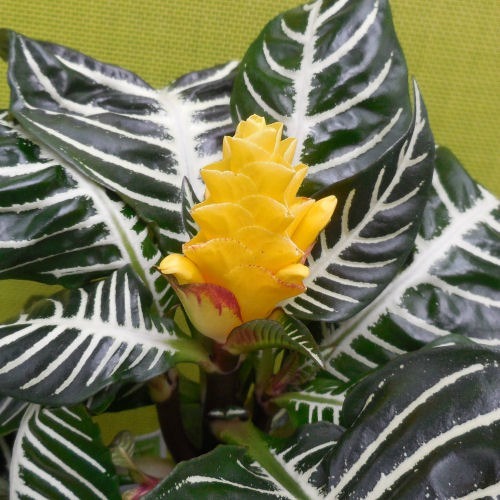 The botanical name for the Zebra plant is aphelandra squarrosa. The plant is fabulous. It has wonderful foliage and such pretty flowers. The leaves are quite large and have bright silvery veins, which give the plant its common name for it. 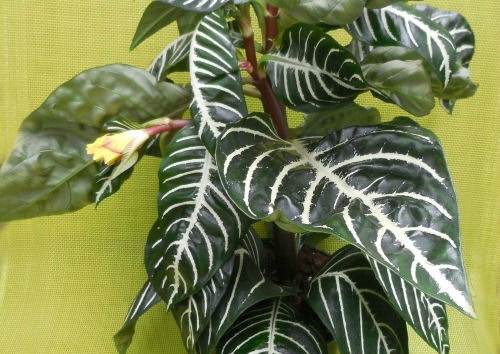 If you love to grow flowering houseplants, zebra plant can’t be beat The flowers come in late summer and autumn on a tall flower stem that is long lasting – some can last for up to six weeks. Everything about the flower is pretty, from the color to the shape. Even if you don’t have just the right flowering conditions, it’s worth growing the plant for its gorgeous glossy striped foliage. It is easy to see where aphelandra squarrosa gets its common name, isn’t it? The plant can be a real challenge to grow outside of very temperate areas. To do well, it needs lots of moisture, just the right humidity and plant food and quite a bit of warm weather. The plant needs bright filtered light. Too much sunlight can cause the leaves to scorch. Water often, the plant likes to be evenly moist but not soggy. Fertilize monthly in the spring, summer and fall with an all purpose plant food. Rotate the pot often so that it will grow without leaning to the light. Mist frequently to give the plant the humidity it loves. You can also give the plant extra humidity by growing it sitting on a layer of pebbles with water under them. Re-pot in the spring each year. Pinch out the growing tips to encourage bushiness. The plant can have a tendency to get leggy. Zebra plants will grow to about 3 feet tall if they get the right conditions. The plant can be propagated by stem cuttings in the spring time, so if you do not have luck with yours, you can try again with pieces of the stem dried out and potted. (bottom heat will give better odds of a new plant forming.) Sometimes cuttings will do better than the original plant. Have you tried to grow a Zebra plant? How did you do with yours?